I’m excited to announce the release of our second ebook, Get Started in UX: the complete guide to launching a career in user experience design. Ever since launching UX Mastery, the single most common question we’ve been asked is: how do I get started? This ebook is a thoroughly researched response to that question, with pages of practical advice to help you launch—and maintain—a successful career in user experience design. We truly believe this is the most comprehensive guide ever written on how to break into user experience. Writing a book that we believe will help people isn’t enough though—we also like to make sure what we’re offering is an amazing deal. To that end, here’s the list of bonus content that comes bundled with this book. All up, there’s over $100 worth of bonus content alone, not even including the ebook itself! Plus if you’re not completely satisfied that this ebook and bundle is incredible value, we stand by our money-back guarantee. However, this amazing bundle will only be available until the end of March 2014, so grab your copy now to avoid missing out. This is an excellent book. It’s thorough & clear and I’ll have no hesitation recommending it to everyone who asks me “how do I get into UX”. As a UI Designer looking to expand my career options, Get Started In UX is a very thorough and useful guide that prepares all the necessary ingredients to becoming a UX Practitioner, and presents them as deliciously digestible bite size chunks. I highly recommend it for aspiring UX practitioners from all backgrounds. What Matt and Luke have put together here is not only great reading, it’s a comprehensive and, more importantly, realistic instruction manual for launching into a UX career. I not only highly recommend it, I wish that I’d had this when I was starting down my own path. Thanks to Matthew and Luke for adding this treasure to the UX treasure chest! 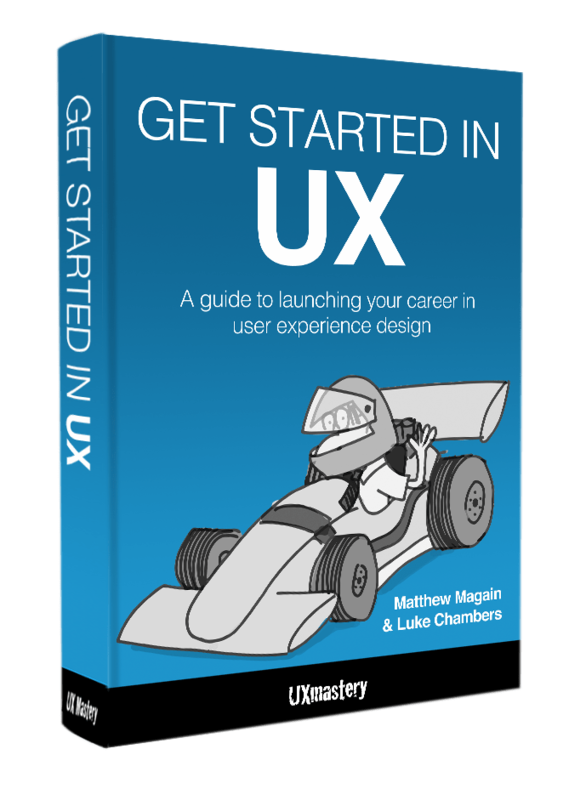 Get Started in UX, the new eBook from Matt and Luke at UX Mastery, is a delight! It strikes the perfect balance of theoretical learnings and practical, ‘roll up your sleeves and get doing’ advice that I’m certain will be useful for absolute beginners and more experienced practitioners alike. You only need one book to get into UX, and this is it. Get Started in UX is your roadmap to a career in UX. It takes you through a complete journey from gaining experience, creating a portfolio and even how to tackle your first interview. You get insight into the minds of professional UXers as well as recruiters on how to land a dream UX job. This book is a must have to landing that job. This is a book for newcomers to the field of UX, although senior practitioners who are looking for a new role will find much of the content useful. That said, “newcomers to UX” aren’t always newcomers to the world of work. In fact, most UX Designers I know began their careers in other roles—industrial design, computer science, graphic design, even filmmaking! If it’s a career change you’re looking for, Get Started in UX is the book for you. I purchased the Kindle version of your book through Amazon but I’m not sure I received the bonus content mentioned above – can you explain?